Set of 14 reusable wipes, storage jar and mesh laundry bag. These handmade reusuable make up remover wipes are made from a bamboo and cotton mix terry cloth fabric, and they are backed with a 100% cotton print fabric. 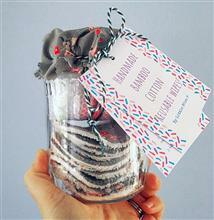 The set comes with seven round make up remover pads, they are in a glass jar with a fabric topper. The set includes a mesh washing bag, so you can easily pop them in the washing machine to clean them. The bamboo and cotton mix fabric is very soft and gentle on skin, and your skin won't feel like it's being pulled when you use them. The wipes are approx 7.5cm in diameter. The glass storage jar are re-purposed food jars, so their shape may vary. The mesh washing bag that is included with the set, is not handmade. These items are ready made and will be posted out as soon as possible.